A Drink For Your Skin! 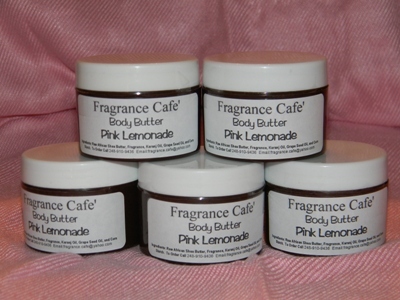 I wanted to offer something different so I decided to make a Pink Lemonade Body Butter. It is made from Raw African Shea Butter as is most of our Body Whips, Body Balms, and Body Butters. This Body Butter is so fresh smelling, not that child like sweetness that you get with most fruit and citrus scented products. It goes on nice and smooth, quickly melting into your skin to give it that much needed drink of moisture, especially as the days get colder and colder in this season. Our Pink Lemonade Body Butter also features Karanj Oil which is known to relieve itching skin and some wounds; Grape Seed Oil leaves a light satin feeling on the skin and is known to have some anti-aging benefits as well as keeping your skin supple and giving your skin an even tone. Many are the benefits of Shea Butter for skin, its known to help relieve dry and itching skin, assists with softening stretch marks, moisturizes chapped skin, wrinkles, signs of aging, soothes rough skin, helps with eczema, skin rashes, dermatitis, and can be used in massage to relieve muscle aches and tension. I like this Body Butter after a long day, and I need a mental pick me up. I just jump in the shower and while my skin is still wet I smooth on this Body Butter. Smells yummy and feels really good on the skin. 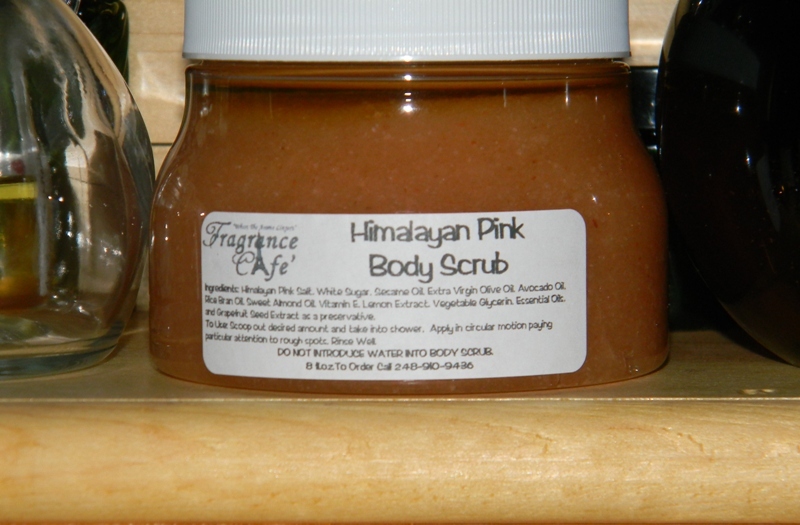 It’s here, and I’m pleased to announce our Himalayan Pink Body Scrub. It features Himalayan Pink Salt and White Sugar. We added some yummy oils like Sesame, Rice Bran, Sweet Almond, Avocado, and Extra Virgin Olive Oil. We tried to pack it with as much of our favorite skin loving things as we could and we are very pleased with the results. It has a blend of Tangerine and Lemon Grass Essential Oils in, but very light so it’s not overpowering. It is truly a treat that takes you away to the finest spa, imagining of course. LOL! Anyway, We are hoping that our clients will enjoy it as much as we do. Himalayan Pink salt has so many benefits for the skin and this is why we chose it. Maybe next time we’ll do a scrub with just Himalayan Pink Salt and the delicious oils, a salt glow perhaps. I so enjoyed putting this one together. I took the fragrance that we selected, phalate free of course, and blended it with Extra Virgin Coconut Oil, and all I can say is WOW! It takes your mind away to some place exotic. We add organic cane sugar, and Grapefruit Seed Extract. 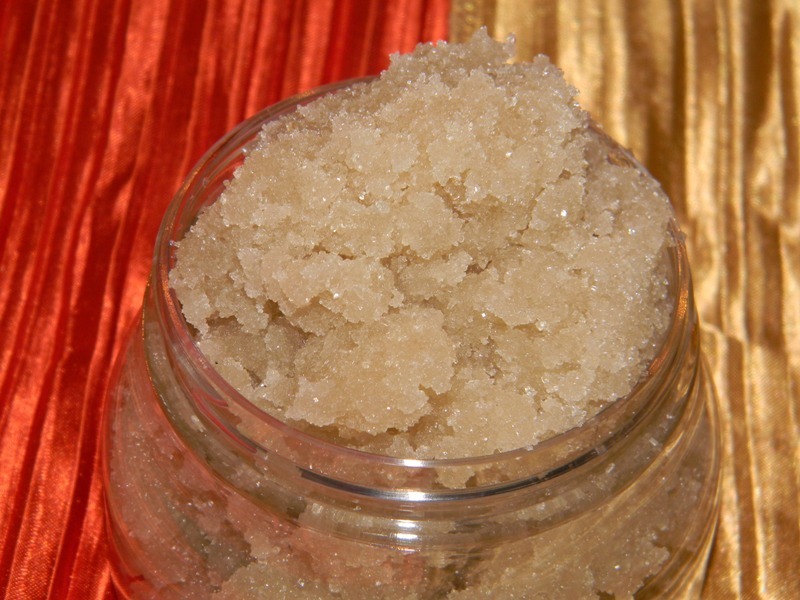 Indulge your senses with this scrub, we may have to make a lotion or body butter with this scent because is just that beautiful. How about a delicate and masterful blend of grapefruit zest, succulent, and juicy mango, and sandalwood. This description pales in comparison to how beautiful the scent is in this scrub. “…a whole lot of pure vanilla perfume oil, vanilla absolute essential oil, a splash of sugar and spice…Camille is confident, and strong and she enjoys being a woman. She’s feminine and sensitive, but able to hold her own…. This is just a simple facial scrub that I actually created for myself. 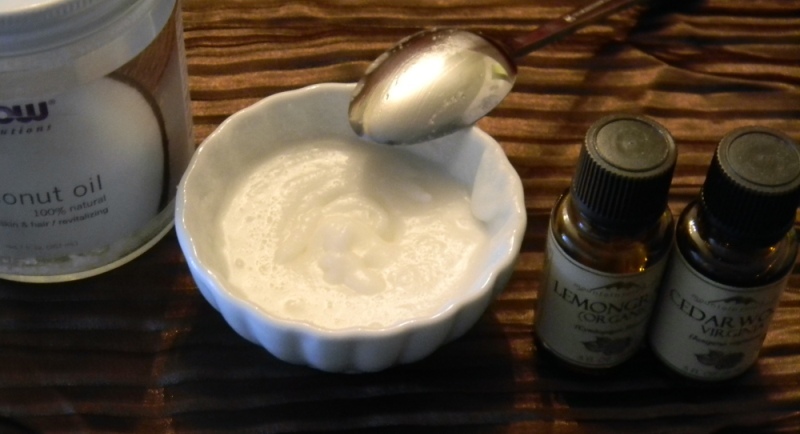 Pure Coconut Oil (unscented), Lemongrass EO, and Cedarwood EO. I like the way the Coconut Oil moisturizes my skin after I rinse the scrub off. Cedarwood EO is an astringent. It’s good for acne, eczema, and oily skin. Lemongrass EO is a bactericidal, an anti-oxidant and anti-septic just to name a few. Plus I love the smell of Lemon Grass EO. I like not having to apply pressure or scrub the scrub off my face because the product is too heavy. I made this scrub just to treat myself to something special that I know will do exactly what I need it to do and nothing extra. I have experienced a couple really harsh store bought scrub and that’s why I made this. I normally just use my little face brush to exfoliate, but like I said, this is for when I want to give myself a little treat. What are some ways you “love your face”? Do you use anything special? Why did you choose that particular thing? I’d love to hear from you. Ok, one of the things I’ve been working on is scrubs. It started with a request from one of my faithful clients and just grew from there. 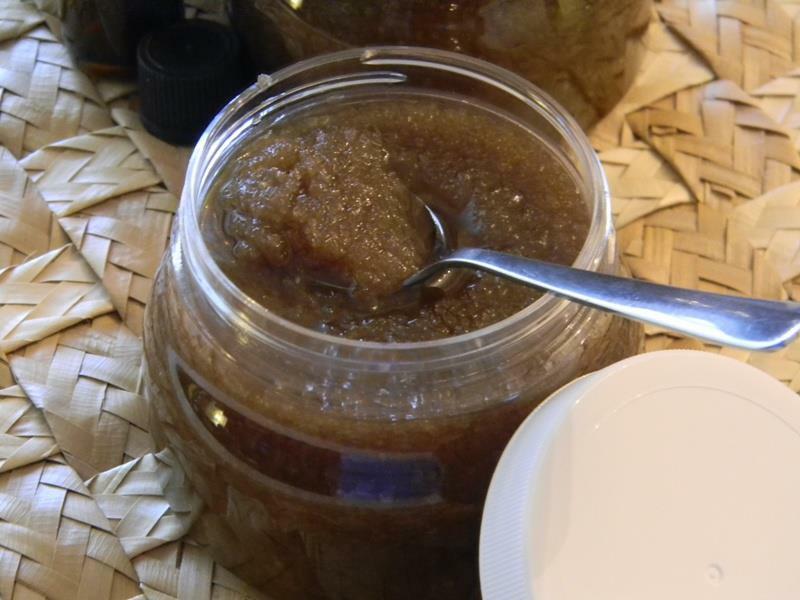 I really want to get into offering fresh scrubs for our clients, but for now we have this wonderful Brown Sugar Body Polish, and then we have Hawaiin Kona Coffee Scrub, and our Gourmet Brown Sugar Scrub (1st one created) with lots of goodies in it. The Body Polish features Organic Raw Sugar and a host of our favorite carrier oils, honey, and grapefruit seed extract. Of course I was the first to try it and I love it. I’m loving the research and knowledge that I gain from taking this step of faith in my business so, I’ll see how far it can go. Happy Scrubbing! Maybe I need to find a coach or somebody I can learn from hands on. Thanks for reading. Feel free to share your thoughts. It’s Body Butter Folks! and I love it. I had been wanting to create a body butter with cocoa butter for the longest time. Some of our clients like Shea Butter, but are die hard Cocoa Butter Fans. So, I wanted to offer them something else besides the normal hard Cocoa Butter that they normally buy. Now don’t misunderstand me…I’m from the “old school” and Cocoa Butter is and was a staple in my house at all times, but it can be a turn off when you really don’t wanna smell like chocolate (hard to believe right, LOL) all day. So I just included the wonderful Raw Cocoa Butter, Extra Virgin Coconut Oil (yummy), Sweet Almond Oil, and a splash of Almond Fragrance to sweeten it up just a touch, some Corn Starch so you slide away with greasiness and VIOLA! I put some on my skin and it melted right in. Before I could post to our clients and friends that it was ready they were ordering and coming by to pick up their little pots of goodness. I was really inspired by one client who said “I love this butter” and hoping to sell out soon…but of course I’ll just make more. In my rush to get it out to our clients, I still have yet to take photos….so, maybe I’ll post one later. By the way, the only ingredients in this Body Butter are the ones you’ve already read about…no preservatives added. Thanks for reading. Do you use Body Butter? What’s your favorite?